A week after reports emerged that the Raiders were thinking of trading several of their recent first-round picks, it appears that they’ve started doing just that. 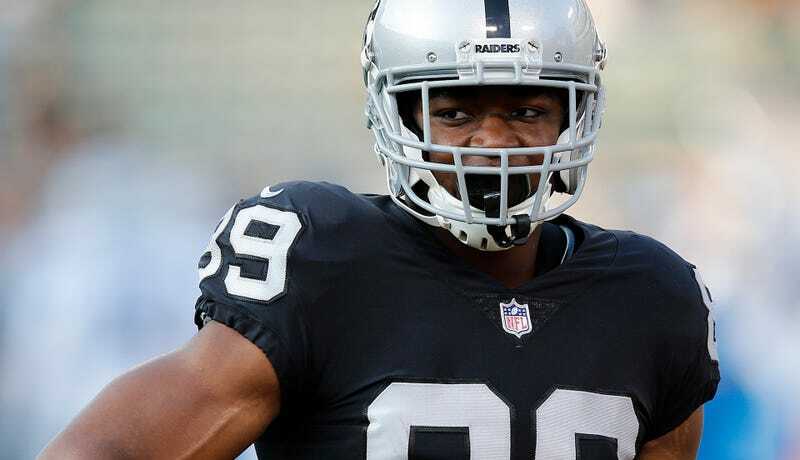 Recently retired NFL cornerback Jerraud Powers first reported that the Raiders would send Cooper to the Cowboys for a first-round pick this afternoon, with ESPN’s Josina Anderson and Adam Schefter confirming shortly after. The Raiders now have three first-round picks in next year’s draft after trading Cooper and Khalil Mack, arguably their best offensive and defensive players from last season. Jon Gruden will get to reshape the team in his image, which is a terrifying prospect for a dude who has never had personnel power like this before. The Raiders might make a few more trades before the deadline, though there are conflicting reports on whether or not they’d trade 2017 first-rounder Gareon Conley. As for the Cowboys, they’ve badly needed a top-tier receiver all year. Cole Beasley leads the team with 33 catches and 50 yards per game, while the other four members of the team’s receiving corps have only a combined 42 catches. Perhaps the addition of a weapon like Cooper will stave off the inevitable firing of head coach Jason Garrett for a few weeks.